Uglyworld #442 - Wedgie's Brain Freeze (99-365), originally uploaded by www.bazpics.com. Wedgehead was impressed with the weather the last few days as we've managed to break through the 20oC barrier most of this week, so he decided to celebrate by buying himself an ice lolly. When he got to the shop he decided on a blue lolly which cost 2 euro's and 50 cents, and he had taken his pocket money for the day (a 5 euro note) with him, unfortunately though the shopkeeper didn't have enough change, now this put the pink guy in a bit of a dilemma - should he take a second lolly - oh hell yeah he thought and grabbed a yellow one. After handing off his 5 euro note to the shopkeeper he walked back to the house while starting to enjoy his blue ice lolly, and all of a sudden BRAIN FREEZE. Wedgie had never experienced brain freeze before so he had no real idea what was going on, so he decided to throw on his hat to try and counteract the feeling of the inside of his head numbing more and more - of course it didn't work. Wedgie then worked out that it was coming from the ice lolly he was eating and remember that there was a second one in his other hand, afraid that this would make his head explode if he was to eat 2 in a row he dashed around and finally found Ice-Bat who was having a nice relaxing day at home. Naturally Ice-Bat has a much greater tolerance to the cold, and when someone offers you some free ice lollies would YOU say no? 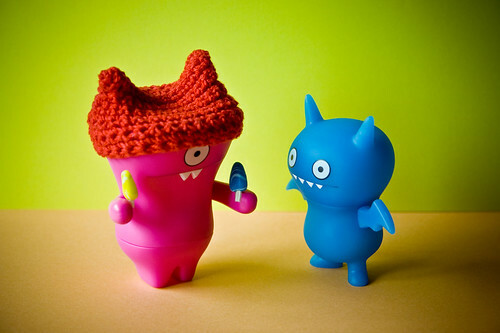 Wedgie had to go lie down to recover from his ordeal, meanwhile Ice-Bat happily munched on a pair of cooling ice lollies.